Pickens County, SC is located in the upstate piedmont region, near Greenville. The highest point in the state is in Pickens County – Sassafras Mountain. It is also home to Table Rock State Park. With a history steeped in agriculture, the area has many bluegrass and country music traditions which students in the YAM programs are learning to carry on. There are several annual festivals celebrating Southern Appalachian Music. 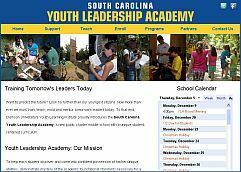 The Youth Leadership Academy YAM program meets every Wednesday from 3:00 – 4:15 at the Youth Learning Institute of Clemson University located in Pickens, SC. This program is for middle school students in grades 6 – 8. The YLA YAM program is unique in that these students receive in-school instruction once per week in addition to meeting once per week in the afternoon. This program is made possible through POSAM, Inc, Pickens Recreation, Pickens Senior center and Hagood Mill.